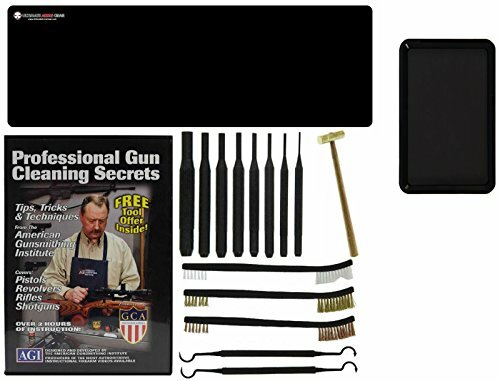 Gun Cleaning Mat 12" x 36" Inches Assist with the Maintenance of your Firearm. Neoprene rubber backing prevents fluids from penetrating through to work surface.The Ultimate Arms Gear Magnetic surface tray keeps small steel parts such as screws, nuts, springs and other small easy to lose parts secured on the tray. Measures 4.5" L x 6.5" W. Designed with the minimum amount of magnetic force to retain parts without rendering them magnetized. Also has raised edges to keep items from rolling off. 5pc Kit (3 Brushes & 2 Pick Tools): Brass/Copper/Soft Nylon Bristled Brush to Prevent Scratching on Gun Parts. Brush Length: 7". Double Ended Pick Tool is Great for Scraping Dirt and Residue from Hard to Reach Places. Pick Length: 7- 1/4".